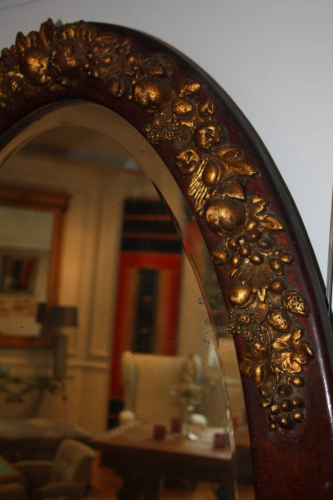 A very unusual burgundy painted and gilt gesso oval mirror. French c1900. With lovely detail of fruits including grapes, apples and strawberries. The original bevelled mirror glass plate shows a few signs of small age spots which is consistent with age but overall does not interfere with reflection and looking into.